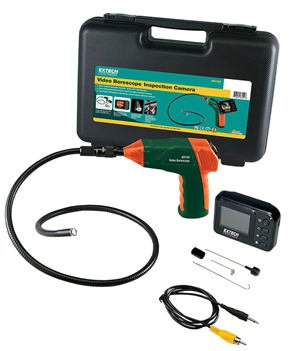 The BR150 Video Borescope features a 2.4 in. color TFT LCD Monitor and a mini 9 mm camera head with a dual light system for high resolution, glare-free, close-up viewing. Gooseneck cable retains configured shape. Detachable display for easy storage. Comes with extension tools (mirror, hook, and magnet), video output jack, and hard case.